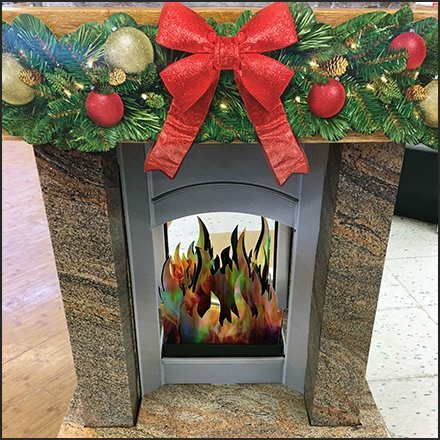 Even the flames are faux in this Christmas Fireplace Gift Card Corrugated Display. And like the most sophisticated of modern home fireplaces it can be enjoyed from multiple directions. Of course that mainly benefits Gift Card sales at this intersection of multiple aisles. Consider this Christmas Fireplace Gift Card Corrugated Display from a range of distances in the gallery of images. See that outfitting was Plastic Butterfly Hooks for Corrugated Display Surface.